if this version is too chaotic, then my version II <-- ( CLICK ON THE II ) might work better for you. thanks to derriiee for the help on this version, and thanks to bromiiee for the color problems. it looks soo...complicated but beautiful!! Yadda, you're getting good with the grungy shtuff. I like it, and bonus points 'cause I'm a big fan of Kingdom Hearts. [the last boss was pretty easy, sephiroth was scary...] But anyway, nice choice of colors. The dots are sort of whoa in a couple of places, but other than that, the wallpaper's awesome. And I like version II better, altho version is pretty good itself. :P Nice work there! ooooo smexy smexy Saki!!!! me likeys a lottt!!! I'm gonna fav this wunnn! Thanks for sharing! hmm... a very grungy and abtract looking wallpaper. like the idea of it though but I must say it looks alittle too messy on the back. O this is soo wicked. <(^__^)> I love these guys. I like the background and everything. "I kinda sound dull...on that." Well ya it all good. i LOVE kingdom hearts. it's the shizz. haha. this is a really nice wallie. saki likes KH too? or you just play it? o well i like it! saki~ it's really nice, different type of grunge that is. this is the grunge work that people tend to see uncommon or whatever but i have a friend making layouts like this and she has this style per se so its rather common to me to find this style.. actually, scenic walls are new to me more than anything. 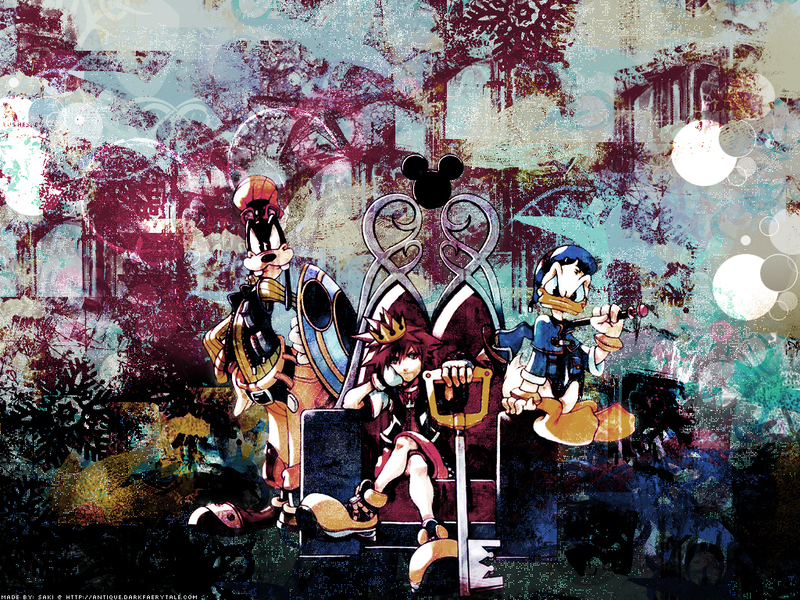 Very cool Kingdom Hearts wallpaper. I like the grunge background of the wall. You got my fav for this.